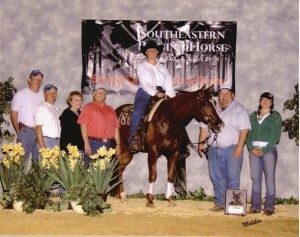 Reserve Champion Developing Horse Futurity! Chics Gunnatrashya ridden and trained by Amanda Yarbrough was Reserve Champion in the Developing Horse Futurity at the Buckeye Reining Classic. Chics Gunnatrashya was bred and raised by Holly Bray of Arlington, Va., at Rising Star Farm.